Welcome home. The first part of our Mission, to provide hope and support to individuals with FOXG1 and their families via any means possible, is what has brought us together today. We have walked your walk, spent countless sleepless days and nights wondering what this all means for this day, week, month, year… lifetime. Everyone deals with the diagnosis and its impact on their family differently; please know whatever your process is, you are not alone anymore-we will support you and welcome you into our family. To learn a little bit more about his the Genetics behind a FOXG1 mutation, please read Genetics, Decoded. It’s how many of us parents found each other to begin with. If you are a parent of a child with FOXG1, be sure to join the Parent Support Group on Facebook. This is a private group with over 200+ active parent participants, where we can share any and all thoughts about this complicated diagnosis with people who understand it. Please keep an eye out in your Message Request Inbox (find out how to access it here) for the group admin’s message as we only allow individuals with a confirmed diagnosis in the group to protect your privacy. Friends, family and others interested in FOXG1 should check out the FOXG1 Family & Friends Group on Facebook to stay in the know and learn how you can support our FOXG1 families. Don’t forget to ‘like’ the International FOXG1 Foundation’s Facebook page for updates and news. Also, you can follow us on Twitter! Interested in a Men’s Group? Check out this support group for dads, uncles, brothers, grandfathers and other men who have a child or family member with CDKL5, RETT, MECP2 and FOXG1 mutations. Please contact jennifer.leonard@foxg1.org for family support information. Wenn Sie Eltern eines Kindes mit FoxG1 Diagnose sind, besuchen Sie unsere private Facebook Gruppe –FoxG1 für deutschsprachige Angehörige oder die offizielle offene deutsche Facebook Gruppe FoxG1. Si usted tiene un hijo con FOXG1 por favor visite nuestro grupo de padres en Facebook. Este grupo es privado y solamente para padres de niños con FOXG1. One of the silver linings of a troubling diagnosis is connecting with other families who understand exactly what you are going through. Get to know some of our FOXG1 family here. Are you interested in sharing your story? Email your story, a picture and the signed Photo and Story Release Form to info@foxg1.org. Every fall we assemble a calendar of our very own foxes and sell it as a fundraiser- it makes a great holiday gift! Here is the link to our 2018 calendar, they do ship internationally. Our cover is a dedication to our foxes that we have lost all too soon, and serves to further push is towards treatments and a cure. If you would like your child’s image and birthday to be featured in the 2019 calendar, please submit this form. Meet Shannon, a very special young woman, diagnosed with a FOXG1 mutation shortly before her death at age 24. She was incredibly involved in her community, volunteering her time on elementary school classrooms, was an avid skier, and attended college. 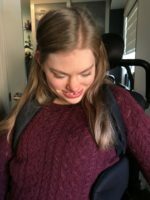 As part of her legacy, Shannon’s family and friends put together Shannon’s Adapted Games Instruction Booklet, filled with instructions on how to adapt several popular games, playing tips and links for purchasing materials. We hope you have as much fun as Shannon did playing these! In 2015 we introduced the Béatrice Fortier Memorial Family Fund, in honor of Béatrice, one of our family to passed away suddenly just shy of her third birthday, and in honor of all of the foxes we have lost. This fund was developed to provide funding for medical needs not otherwise covered by insurance. For the application, please click here. Who doesn’t love getting mail? If you would like your fox to get a birthday card from the Foundation, please fill out this form and click submit. This information will remain private and will not be used for any other purpose. Global GenesⓇ, a rare disease patient advocacy organization, offers RARE Toolkits, which provide individuals with usable information on a variety of topics related to living with and/or advocating for rare disease patients. RARE Toolkits are being created in collaboration with key rare disease stakeholders that have developed a vast array of subject matter expertise and believe in the importance of sharing these best practices. Want to stay up to date? Subscribe to our newsletter here. FOXG1 Syndrome was is was once referred to as a Variant of Rett Syndrome? And that in some countries it has never been associated with Rett Syndrome at all? Yes, we agree – this makes things complicated. As the science has progressed, researchers have begun to better understand the distinctions between FOXG1 and Rett Syndrome. Since it presents similarly to Rett Syndrome, MECP2 Duplication Syndrome and CDKL5, we actually have a small family of “sister syndromes”, rather than Rett being the “parent syndrome”. We are able to learn from these other teams of dedicated parents and researchers, and we firmly believe that advancements made in any one particular group helps us all. Learn more about our sister syndromes by clicking the links below.